When GOES-17 launched, meteorologists’ hearts skipped a beat. 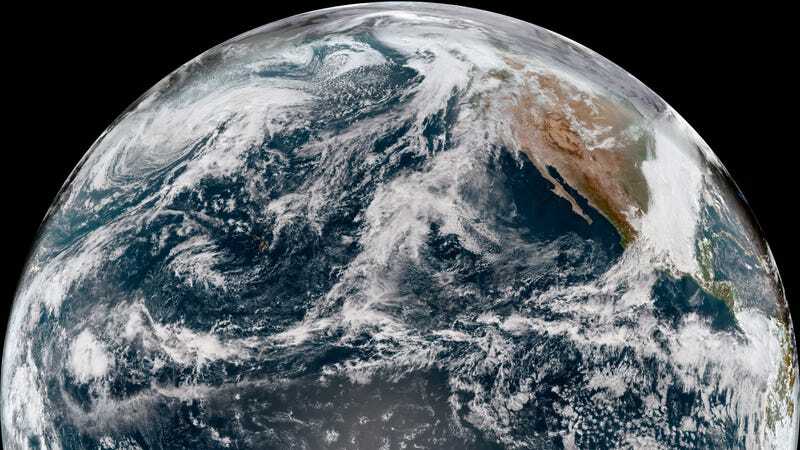 The satellite offered a chance to view all of the U.S. in superieure hoge resolutie, en met het, de weather forecasting possibilities were endless. The National Oceanic and Atmospheric Administration launched the satellite in March, but it finally got it positioned in its permanent location late last month. The agency has now released the first satellite images from that new spot. And folks, I am here to tell you the pictures are very good. In its testing location, it was able to see the western U.S. But its final resting spot 22,240 miles above the Earth’s surface centered about 137.2 degrees West and the equator opens up a whole new world of possibilities. The new images include incredibly high resolution satellite imagery of Hawaii, Alaska, and a vast swath of the Pacific Ocean. Keep the clouds skirting over the Hawaiian islands on just another day in paradise. It’s so crisp, I can almost imagine myself on the beach there with a daquiri instead of New York at the height of gray-brown fall the worst season. In addition to a real color channel, GOES-17 also does high-resolution infrared imagery. Looking at infrared channels is one of the ways meteorologists can peer into a storm to understand what’s going on. That’s in turn helps with forecasting, and GOES-17’s all-seeing eye will offer the chance to make real forecast improvements. The newly released infrared imagery shows a powerful storm that rocked Alaska earlier this week with hurricane-force winds. It had a hurricane-like structure with an eye at the center. On the more unfortunate but equally important side of the spectrum, GOES-17 was able to capture the Woolsey Fire exploding in Southern California. The smoke from the fire which has burned Malibu and surrounding areas over the past week is clearly visible from space. In addition, the satellite has the ability to detect fire hot spots. That capability can provide near real-time clues for four managers and improve how they respond to fires, especially in hard-to-access terrain. Right now, we are in the oooh and aaah phase of GOES-17. De imagery er alle dubbed non-operative, som i ikke-NOAA-sprog betyder at de ikke er blevet anvendt til forecasting endnu. Der er stadig testet, der skal udføres, og arbejdsflow skal være oprettet. Men de gir en snapshot af hvad meteorologer kommer til å jobbe med. The satellite will join GOES-16 and Japan’s Himiwari-8, two other high resolution satellites in orbit across the equator. Together, they provide an unprecedented view of the planet. NOAA is planning to launch two more GOES satellites that will further improve our eyes in space. So, the meteorological hype wave and forecast improvements are not going to end anytime soon. Og det vil heller ikke være den stream of images of our awesome planet for the rest of us to gawk at.